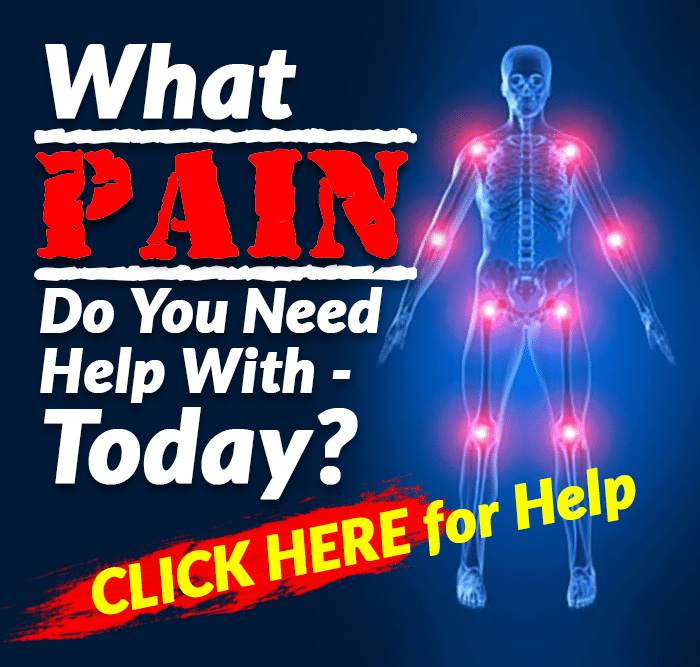 Many people ask how to get relief from their pain. At Exercises for Injuries, we offer numerous videos demonstrating exercises that can help to reduce the amount of pain we experience. However, when it comes to directly treating pain, the secret could be in what we are eating. 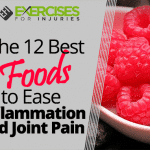 Of course, eating foods with anti-inflammatory properties and avoiding foods that cause inflammation will indirectly relieve pain. 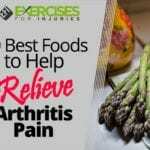 Reducing inflammation will help with arthritis and lessen back, neck and joint pain, but can we go further and find foods that actively bring us relief when the pain does come. 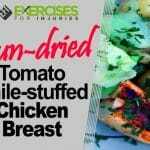 I have been researching ingredients that are both good for inflammation sufferers and have natural pain-relieving properties. 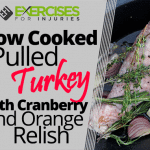 How great to be able to get relief from pain while also eating healthily. 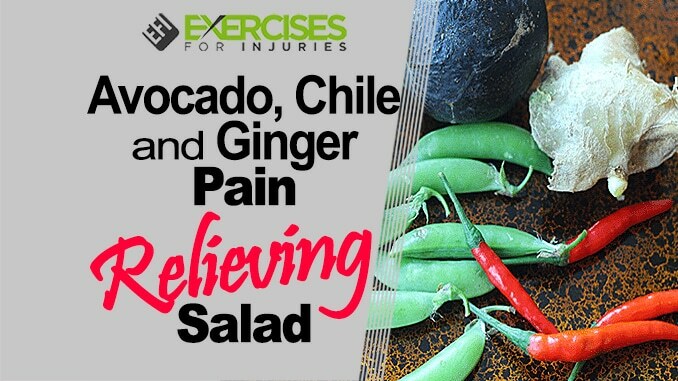 The three main pain-relieving ingredients for this recipe are avocados, fresh ginger and a red chile pepper. Happily, the flavors also work well together and lend themselves naturally to an Asian-style preparation. Avocados are full of nutrients like vitamin K and vitamin B6, dietary fiber and potassium, containing even more of the latter than bananas. However, the real magic lies in the fatty acids they contain. These are often referred to as “good fats” and have been shown to block the inflammatory mediators activated by the immune system, thus reducing the pain caused by inflammation. The fatty acids also help to maintain healthy cartilage and tissues, meaning you are less likely to feel pain in the future. We all know what happens when you eat too much hot, spicy food, and it’s certainly not pain relief, but the capsaicin from certain varieties of chiles can ease the pain from arthritis and joint pain. Peppers from the Capsicum genus like jalapeños, cayenne, and tabasco peppers are the ones to go for. Capsaicin is so effective it is sold in a concentrated form over the counter as a cream for pain relief. I have to advocate the use of chiles in moderation, but you can test out how much works for you and tweak amounts to see how effective it is in relieving your pain. 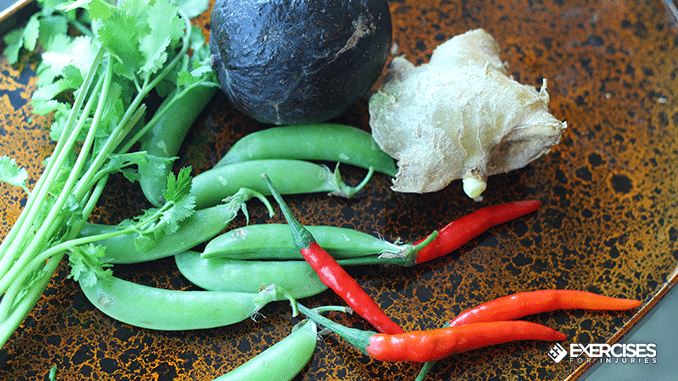 The capsaicin works by releasing endorphins into the brain. These are the happy hormones that are associated with pain relief. This is the reason we can get addicted to the chile buzz, even if it initially burns the mouth. The third pain reliever in this recipe is fresh ginger, used for centuries by the Chinese to treat pain. The fiery root is a powerful anti-inflammatory, but also has anti-ulcer, antioxidant and surprising analgesic properties, so it is a pain reliever of the highest order. 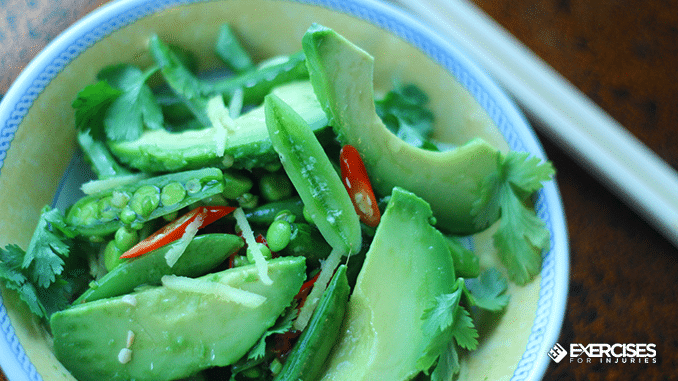 The creamy avocado will contrast with the ginger and fiery chiles, with freshness from lime juice and cilantro, and crunch from nutty sesame seeds and sugar snap peas. Hopefully, you will find the Asian-inspired salad nutritious and soothing but if nothing else it will be delicious. This salad can be enjoyed on its own or with some rice noodles, which are easy to digest and a good source of fiber, zinc and iron. Grab those chopsticks ― or a fork ― from the utensil drawer and dig in. Choose firm but ripe avocados so that they keep their structure when sliced and dressed. Leave the peeling and pitting until the last minute as they will brown quickly. Mix the dressing ingredients well in a bowl. Peel the ginger and slice finely. The best way to peel it is to use a teaspoon to scrape off the skin. Then, infuse the ginger in the dressing ― the longer, the better to extract the flavor. Toast the sesame seeds in a hot, dry pan until fragrant and evenly browned, around two or three minutes. Set aside to cool. Just before serving, slice the chile pepper and green onions finely. Top the sugar-snap peas and slice them in half lengthwise. Cut the avocados lengthwise around the stone and remove it. Scoop out the flesh with a tablespoon carefully, preserving the shape. Cut the avocado into 1/4-inch slices. Assemble the salad ingredients in a large bowl. Pour the dressing on top and toss the ingredients carefully. Adjust the seasonings with more soy sauce for saltiness, chile pepper for heat or vinegar or lime juice for acidity to your taste. Tear fresh cilantro leaves and top the salad with them. 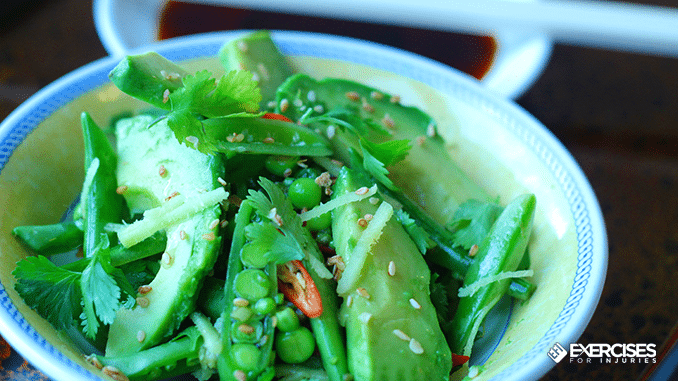 Sprinkle the salad with sesame seeds and serve. 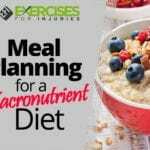 If you want to know what foods will help you restore your natural vitality and get slim and stay slim, then check out the Best Foods That Rapidly Slim & Heal in 7 Days.